Both of these plants have yellow flowers and are in the Asteraceae Family. This family is sometimes called the Composite or Sunflower Family. 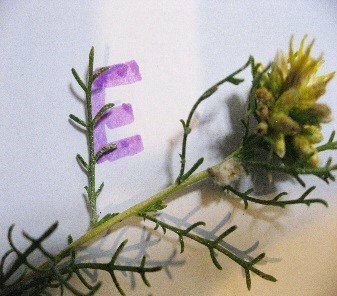 Composite refers to the configu- ration of the flowers. Each blossom is actually a group of flowers. If you think of a sunflower, each of those tiny blossoms in the center, the disk flowers, is a complete flower and will form a fruit when pollinated. Each of the petals (rays) can also be a complete flower and can also form fruit. Some plants in this family have disk and ray flowers – Desert Zinnia (Zinnia acerosa); some have only ray flowers – Desert Chicory (Rafinesquia neomexicana); and some have only disk flowers – Odora (Porophyllum gracile). 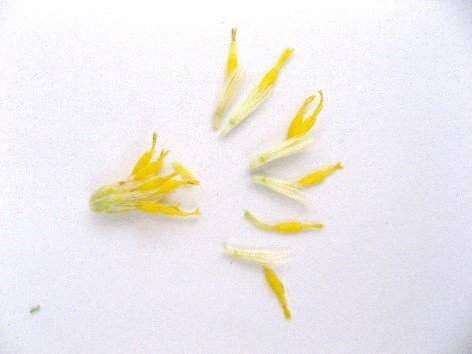 Burroweed (Isocoma tenuisecta) has only disk flowers. 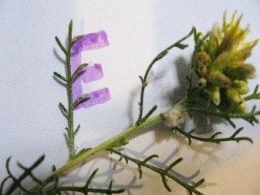 Isocoma refers to floral hair tufts, tenuisecta means fine cut, probably referring to the leaves. 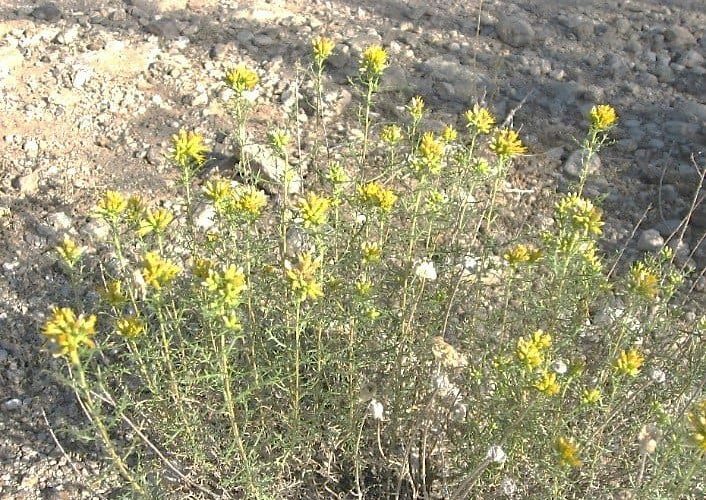 Burroweed is a native perennial and likes to grow in dry, gravelly disturbed areas such as overgrazed land, roadsides, parking lots and dirt roads. This plant is a host plant for some beetle species. 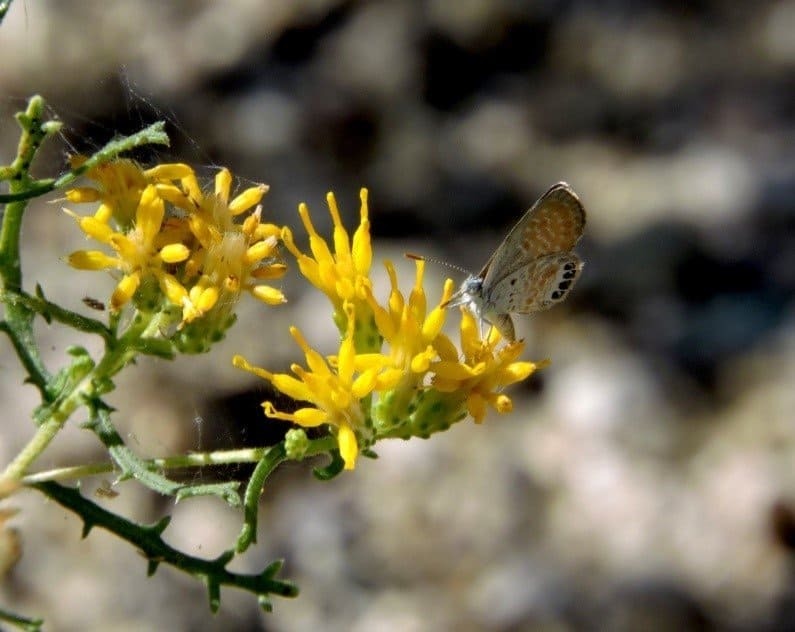 Pygmy Blue, Checkered Skipper and American Snout butterflies have been observed obtaining nectar from these plants. Bees and flies also frequent the flowers in search of pollen. 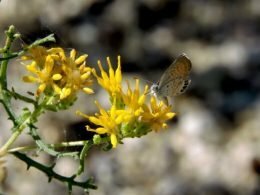 However, Burroweed is poisonous and livestock can become sick from eating it. Humans or suckling animals may be poisoned by milk from poisoned cows. The plant contains a chemical called trementol, which can cause trembling. The yellow flower heads are small but can put on a showy display when they bloom in masses in the late summer and early fall. Look for it along the roadsides and trails in Sabino Canyon up through November. And now you’ll remember which “Burro” you’re seeing.